David Grossbaum concentrates his practice in the areas of professional liability defense and insurance coverage. He represents legal, real estate and insurance professionals, accountants and securities brokers/registered representatives in liability cases. He has also handled personal injury, fidelity, products liability cases and contract surety matters. Mr. Grossbaum's insurance coverage work has involved matters throughout the country, and he acts as national and regional coverage counsel for several clients. 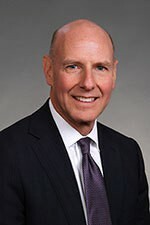 Mr. Grossbaum joined Hinshaw & Culbertson LLP in July 2005 to open the firm's Boston and Providence offices. He is a past leader of the firm's Insurance Services Practice Group and is also a past member of Hinshaw's Executive Committee. Upon graduation from law school in 1985, he clerked with the Superior Court for the Commonwealth of Massachusetts. Thereafter, he became an Assistant District Attorney for Essex County, Massachusetts, where he was assigned to both the trial and appellate divisions, arguing numerous cases in the Supreme Judicial Court and Appeals Court of Massachusetts and trying jury cases. He also held a position as a legal research and writing instructor at Boston University Law School. Cambridge Trust Co. v. Commercial Union, 32 Mass. App. Ct. 561, 591 N.E. 2d 1117 (1992).